Maccaferri’s “reinforced soil” systems are at the forefront in stabilizing steep slopes with competitive costs, long life and high degree of adaptability to most geotechnical contexts. Soil erosion as a result of slope instability is a chronic issue nowadays, undermining local environment and human settlements. The unpredictability of rainfall and adverse weather events make the environment increasingly vulnerable, jeopardizing human activities, interrupting roads and railway links; the economic impacts can be significant. Hydrogeological hazards with greater frequency fill the headlines today. Taking action to protect and stabilize unstable slopes and the soils upon them is by now an essential component of territorial planning: the stability of grounds upon which much of human activity is based is something we can not take for granted anymore. The market is crowded with different solutions designed to stabilize slopes and stop erosion, but solutions are not equivalent at all: the “old” civil engineering adds heavy solutions, wipes out the green whilst adding much gray. The civil engineering of the future minimizes, with agile and eco-friendly, light and cost-competitive structures, the ecological footprint of each building site. But does such a solution, able to secure the ground yet allowing it to “breathe” and leave its biological characteristics intact, actually exist? The answer is yes and its name is Terramesh. The solution, patented by Maccaferri, achieves outstanding results in terms of slope stability without “choking” the ground. Terramesh features geogrid soil reinforcement with an integral fascia system and is used to reinforce soil slopes, making them stand steeper, accommodate greater loads and settle less. Especially within the “Green Terramesh” version of the solution, the reinforcing function is complemented with the ability for the steep, stable slope face to revegetate. This can satisfy clients and designers with a long design life with tried and tested geogrid soil reinforcement, as well as environmental engineers with a green vegetation covered fascia. 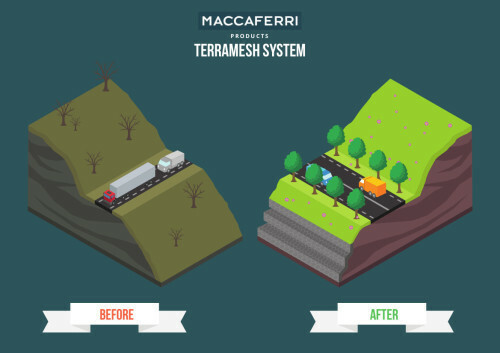 Preserving terrain’s permeability and “breathing” capacity, Terramesh combines stabilization and environmental sustainability needs, without affecting the cost-competitiveness of the product, which confirms to be efficient and adaptable to the most diverse contexts. Don’t think that just because Terramesh and Green Terramesh form environmentally sensitive structures that they can only be used on small or less demanding structures. They have been used on some of the tallest reinforced soil structures in the world. A project in Sikkim, NW India stands at over 70m tall, and has survived significant earthquakes, completely in-tact. Maccaferri is a leader in the design, supply and implementation of “soil reinforcement” systems, but is also active across the whole supply chain, from initial planning to implementation: by providing powerful software aimed at perfectly sizing and customizing infrastructure (specifically, MACSTARS W), nothing is left to chance, optimizing projects that fit perfectly both in terms of technical performance, environmental compatibility and architectural harmony. The Terramesh system consists of a wide range of flexible and proven solutions. There are now thousands of installations across the world boasting an excellent state of efficiency and conservation. For more information about our reinforced earth systems, please contact us.